A major part of my role at CNEWA is saying “Thank you” to all who make our work possible. While our donors come from all walks of life, it’s rare that I get a chance to thank people who are much younger than me — those whom Pope Francis has called “the strength that moves us forward.” This past Sunday, I had the chance to do just that, visiting the Church of St. Rosalie in Hampton Bays, New York. Greeted by delightful spring weather — and a vibrant parish to match — I was there on behalf of CNEWA to accept a donation from the parish’s faith formation students. For the second year in a row, they had collected change in mite boxes for our work in the Middle East with displaced Christian children and others in need. Their small sacrifices had added up to a generous donation of $1,000 to CNEWA, in addition to gifts for their community food pantry. I was welcomed by the church’s dynamic pastor, the Rev. Edward Sheridan, along with Marion Boden of the parish’s Committee of the Common Good, who arranged the mite box project with religion formation coordinator Eileen McPhelin. In his homily, directed to the young Sunday school students who sat on mats in front of the pews, Father Ed preached about the day’s Gospel, from John. He explained that, through simple means like donating our change, we are indeed loving one another as Jesus has loved us. In my brief remarks after Communion, I shared the story of a young girl Msgr. Kozar had met on one of his visits to Iraq, who told him, “They have taken our homes, but they will never take our faith.” Through our faith, and love for each other, we are able to give that most precious gift of hope to those who need it most. As always, if you’re interested in having CNEWA visit your parish and spread our mission of hope, please do not hesitate to contact Norma Intriago, Director of Development, at nintriago@cnewa.org. In this image from 2010, a dance group performs at the annual Greek Festival in Salt Lake City. 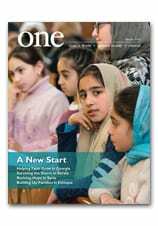 To learn more about a thriving community of Greek Americans preserving their culture in Mormon country, read Greek Orthodoxy in Mormon Zion in the July 2010 edition of ONE. The closer you get to the Jersey Shore, the more idyllic everything seems. If it’s not the cedar shake siding on the quaint homes, it’s the little ice cream shops or perhaps even the way the pine trees could almost masquerade as palm trees as they sway with the wind. A recent visit to Point Pleasant Beach, in fact, sent us from New York down the parkway and into the heart of this idyllic community. Norma Intriago, CNEWA’s Director of Development, and I were privileged to offer a presentation to the Rosary Altar Society at St. Peter’s Catholic Church — a bedrock of the Point Pleasant community and a beautiful church and school at that. Our presentation highlighted the suffering and the hope of the people of Iraq who have fled ISIS — often not just once, but two or three times as the terrorist group gained territory, forcing migration farther east across the Nineveh Plain. Not all who have fled to places like Erbil made it there safely, such as the Yazidi father and son who are now without mother and wife, daughter and sister. Their stories have become important, but difficult for us to hear and share. That said, while much can and should be told of the tragedy these Iraqis are facing, our work there for, with, and through people such as the Dominican Sisters of St. Catherine of Siena means that we can focus on sharing stories of faith and hope. They are stories about the start of a makeshift school that sees 500 eager students daily. They are stories of clinics and pharmacies offering much-needed healthcare. They are stories that would never have been told had the people here not been connected with the people there. Bringing our program to the parish level is, for me, all about supporting those connections and saying, “This is what’s happening; these are the brothers and sisters it’s happening to, and here’s the hope you’re bringing them.” The people of the Point Pleasant community so understood and appreciated that message and they were eager to be even more connected. Indeed, at the end of our presentation, a kind gentleman in the audience shared that his young daughter had brought home a flier about our event. He knew he had to come, he said. After all, he’s a Christian from Baghdad who knew well the plight his people are facing. And this work is so very important to him. Norma and I couldn't have been more thankful for our time there and for the people we met. If you’re interested in having CNEWA visit your parish and spread our mission of hope, please do not hesitate to contact Norma Intriago, Director of Development, at nintriago@cnewa.org. Philip W. Eubanks is a Development Associate for CNEWA in New York City. Anna Hafeli, 97, has been supporting CNEWA for decades through a variety of programs. Anna is a marvel: a 97-years-young powerhouse who exudes such joy, you can’t help but be uplifted in her presence. She has been contributing to CNEWA for decades — supporting our seminarian programs and work in the Middle East and the Horn of Africa. She also has four annuities through CNEWA. Touched that we took the time to drop by, she shared with us stories of her journey from her youth in Switzerland, to Canada, and then finally to California, where she worked a variety of odd jobs — mostly as a waitress — to make ends meet. ...To me, Anna represents the heart and soul of what CNEWA is about: faithful, committed people who quietly and selflessly give whatever they can to help those in need. Their generous spirit so often goes unnoticed. But today, I’d like you to notice Anna Hafeli. Thank you, Anna, for all you’ve done to make a difference in the lives of so many. Want to join Anna and others like her in our mission? Visit this link. The meltdown at the Soviet plant was the worst nuclear disaster in history. An uncontrolled reaction blew the roof off, spewing out a cloud of radioactive material which drifted into other parts of the USSR, including Russia and Belarus, and northern Europe. Relatives of those who died attended candle-lit vigils at several churches, including at Slavutych, a town built to re-house workers who lived near the nuclear plant. A series of events are being held throughout the day. Ukrainian President Petro Poroshenko laid a wreath and observed a minute’s silence in the Ukrainian capital Kiev before heading north for a ceremony at the plant itself, not far from the Belarussian border. Speaking in Chernobyl, he said the nuclear disaster had been Ukraine’s biggest challenge between the Nazi occupation in World War Two and the recent conflict in eastern Ukraine, which he described as “Russian aggression”. Vasyl Markin, who had been working in Chernobyl at the time of the disaster, attended the midnight vigil in Slavutych. The disaster forced over 250,000 to be relocated and resulted in the deaths of thousands from radiation poisoning, including 31 clean up workers. Pope Francis on Wednesday prayed for the victims of the Chernobyl Nuclear Power Station disaster 30 years from the tragedy. Addressing the various groups of pilgrims of different nationalities present in St. Peter’s Square for the General Audience, the Pope had special greetings for those from Ukraine and Belarus. Msgr. John E. Kozar, President of Catholic Near East Welfare Association (CNEWA) was invited to be the keynote speaker at a Convocation and Priests’ Study Day for the priests of the Diocese of Providence, Rhode Island, on 18 April 2016. I was fortunate to accompany him on this short trip. The topic of the Study Day was the current situation of Christians in the Middle East. With over 150 priests, Bishop Thomas J. Tobin and two other bishops in attendance, Msgr. Kozar spoke about his recent trip to Erbil and Iraqi Kurdistan. Accompanied by Cardinal Timothy Dolan of New York and Bishop William Murphy of Rockville Centre, New York, monsignor led a pastoral visit to the many different projects that CNEWA supports for the over 120,000 Christians who fled the onslaught of ISIS in August 2104. It was Msgr. Kozar’s second trip to Erbil. He spoke of the tremendous needs of the displaced people in the region. He told the assembled priests of how CNEWA works with the local church to build up the societal and human infrastructure of the camps where the displaced Iraqis are housed. Although there have been noticeable improvements in their lives — many no longer live in tents and have educational and health care opportunities available — the longer they are away from the homes, the greater is their despair. Monsignor reported on one the more creative projects which CNEWA supports: namely, two mobile clinics which can bring medical care to those who are at a distance from Erbil and unable to access the more permanent clinics which have been set up. He also spoke warmly of a visit to a village where he was welcomed by Catholic and Orthodox Christians as well as Yazidis. The presentation was followed by a lively exchange of questions and comments. Many of the participants said that they found the Study Day very helpful in informing them about a critical topic that is important to their ministries.